Raj Patel is an award-winning writer, activist and academic. With degrees from the University of Oxford, the London School of Economics and Cornell University, he has worked for the World Bank and WTO—and protested against them around the world. In 2016, Patel was recognized with a James Beard Foundation Leadership Award. In his Wrigley Lecture, Patel will argue that everything we understand today about the food system—from its influence on wage work to the nation-state—has its origins in the 15th century. By looking at these origins, and 21st century ways of re-imagining them, it becomes easier to see how changing how we eat can change the world. 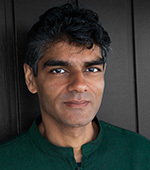 In addition to publications in economics, philosophy, politics, and public-health journals, Patel regularly writes for The Guardian and has contributed to the Financial Times, Los Angeles Times, New York Times, Times of India, The San Francisco Chronicle, The Mail on Sunday, and The Observer. He is the author of "Stuffed and Starved: The Hidden Battle for the World Food System" and "The Value of Nothing" (a New York Times and international best-seller). His latest book, co-written with Jason W. Moore, is "A History of the World in Seven Cheap Things." Join us for a post-talk reception. Co-sponsored by ASU’s Food Systems Transformation Initiative and the School of International Letters and Cultures, in collaboration with the Swette Center for Sustainable Food Systems.